You are here: Home > In the news: What next for anti-amyloid Alzheimer’s drugs? It’s been a long and agonising wait for clinical trial results to show whether a treatment called solanezumab could be the first new drug licenced for Alzheimer’s in over a decade. But today, hopes seem to have faded for the drug after it failed to meet its primary endpoint in another phase III clinical trial. So what does this mean for the long search for effective new Alzheimer’s treatments and what does it tell us about the progress of research into the disease so far? 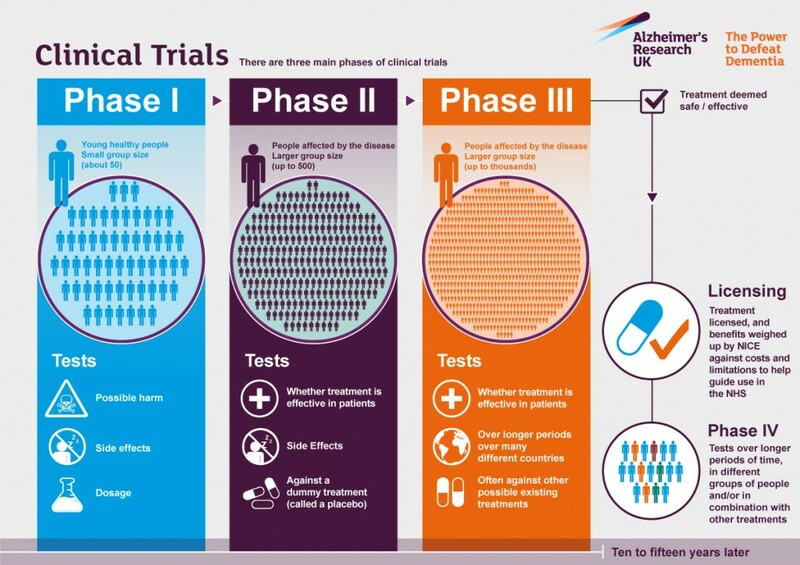 It’s been almost 15 years since the last Alzheimer’s drug was licenced for patients and sadly over 99% of clinical trials for new Alzheimer’s drugs have failed since then. To be successful in clinical trials, new Alzheimer’s drugs need to show benefits for memory and thinking that outweigh any effect of a placebo or ‘dummy’ treatment. Sadly, no drug has yet overcome this hurdle and solanezumab has also fallen short. Solanezumab is one of several drugs in development that are designed to stop the build-up of a protein called amyloid in the brain – a hallmark of Alzheimer’s. Amyloid plaques were first observed in the brain in Alzheimer’s over a century ago. The build-up of amyloid plaques is thought to trigger a harmful cascade that kills nerve cells – a theory central to Alzheimer’s drug development over the past 20 years. Researchers hope that by blocking this build-up, they have a shot at slowing the disease. But proving this theory has not been easy. View our timeline below to follow the history of these discoveries. In recent years, we’ve seen several potential anti-amyloid drugs shelved after failing to benefit patients. This has triggered new areas of research exploring other potential targets for Alzheimer’s, which is continuing with momentum today. However, with so much time and resource invested into the development of anti-amyloid drugs, researchers are not keen to give up until they have explored every potential avenue for success. Between 2005 and 2012, you helped us fund a Southampton team that followed up one of the first failed anti-amyloid trials. Their important observations led them to suggest that these drugs may only be effective when given early in the disease – a critical window when amyloid is building up in the brain. This prediction was backed up when the first two phase III clinical trials of solanezumab failed to slow memory and thinking in people with mild-to-moderate Alzheimer’s back in 2012. Although some argued the drug should be scrapped back then, the makers of solanezumab (Lilly) saw a glimmer of hope. The silver lining was that there did seem to be a slowing of memory and thinking decline but only in people with mild Alzheimer’s and because of this, the statistics weren’t robust enough to declare it a success. This chimed with what researchers had previously predicted about timing and so in 2013, Lilly kicked-off their third clinical trial focusing only on people with mild Alzheimer’s. Sadly, the findings didn’t repeat the benefits seen in 2012. The results announced today show that compared to people on a placebo, those taking solanezumab fared no better in tests of memory and thinking skills – a key measure of whether the drug could help this group of people. Although people on solanezumab had marginally better results in some other tests, the size of the difference was too small to show any real benefit of the drug. A lot more analysis of all the extensive trial data will begin in earnest from today. Will this mean the end of the road for anti-amyloid drugs? Almost certainly not. There will inevitably be questions about whether solanezumab was given early enough, or whether it was the best way of targeting amyloid. Other anti-amyloid drugs coming through clinical trials, like aducanumab and verubecestat, work in slightly different ways and both are being tested in people at an even earlier stage of the disease. Lilly is already embarking on a fourth phase III clinical trial of solanezumab in people with ‘prodromal Alzheimer’s’ – the step before mild Alzheimer’s. That means people who do not yet have symptoms severe enough to be diagnosed with dementia, but have early memory and thinking problems as well as signs of amyloid in the brain. Amyloid levels are determined either using a sophisticated amyloid PET brain scan or through a spinal fluid test called a lumbar puncture. Neither of these techniques is used routinely in the NHS in people with early memory problems, raising some potential logistical hurdles down the line if these trials do work in future. The results of these studies are due over the coming years and will help to put some of these theories to rest. In the meantime, there are still many reasons to be positive about the progress being made in research. Since the ‘amyloid cascade hypothesis’ first rose to fame in the early 1990s, our understanding of the biology of Alzheimer’s has expanded and deepened. For example, we know from genetic studies that different, rare versions of the gene that controls amyloid can either cause Alzheimer’s early in life, or can protect people from developing the disease even in very old age. Thanks to research you’ve helped us fund, new genetic discoveries have also implicated processes like inflammation and metabolism in the disease which we are now pursuing further. Research into the tau protein – and how to block its build-up – is gaining pace, with several drug companies starting to take anti-tau drugs into clinical trials in people. We’re also seeing new trials not only for treatments that aim to slow the disease, but those that may be more effective at managing people’s symptoms. Our Global Clinical Trials Fund is designed to support trials of both drug and non-drug treatment approaches and our first award is helping a University of Oxford team explore whether aspirin and omega-3 fish oils could benefit memory and thinking those at risk of dementia. Over the past two years, you’ve already helped us to establish some cutting-edge drug discovery initiatives like our Drug Discovery Alliance and Dementia Consortium. Through these, we’re already funding innovative drug discovery projects exploring new aspects of the biology of Alzheimer’s and other dementias. Drug discovery is not a quick and easy process, but having a broad pipeline of approaches gives us the greatest chance of success for people affected by dementia. And that is our reason for existing. David Reynolds is the Chief Scientific Officer of Alzheimer’s Research UK, which is UK’s leading research charity aiming to defeat dementia. Previously David worked in the pharmaceutical industry for 18 years at Merck Sharp & Dohme, Lundbeck and latterly Pfizer, where he was the Cambridge Neuroscience & Pain research site head. 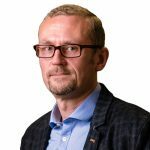 He has held a variety of R&D leadership roles with responsibilities ranging from exploratory biology, through drug discovery, early clinical development and business development in multiple disease areas, but with a focus on neuroscience and pain. One Response to In the news: What next for anti-amyloid Alzheimer’s drugs? I would urge everyone to very closely read the results of LMTX phase3 trial which were published on Nov 15th in Lancet. While the primary end point was missed, when the drug was taken as monotherapy the results were extraordinary – unprecedented improvements in ADAS cog and also backed up by brain scans. The results of a second phase3 trial will be released soon… This Tau Inhibitor is the closest anyone has come to an effective treatment for AD but no one seems to be paying attention because Taurx is a tiny company and big pharma drugs get all the attention.